Thinking about putting yourself out there and hosting a seminar or webinar? Hosting a real estate webinar or seminar is one of the best lead generation techniques, but it’s one that most agents and brokers overlook. A lot of the reasons relate to the fact that hosting these events takes a lot of time and planning; however, the rewards of hosting a well-attended educational session can be immense, since you know anyone attending has a strong enough interest in your topic to sit through your discussion. Below are some items to keep in mind if you’re thinking of hosting a real estate seminar or webinar. The primary difference between a seminar and a webinar is whether it’s held online (a webinar) or in person (a seminar). 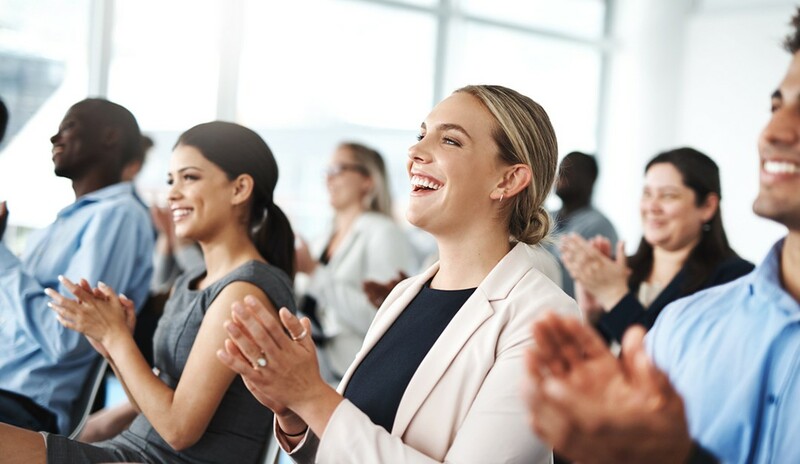 One of the benefits of a seminar is that it takes place in person, and can be easier to make a personal connection and gauge your audience’s engagement. Seminars also don’t require much technological know-how—just your classic sales techniques with some free information added in. On the other hand, a webinar can have many people or just a few attend without affecting proceedings. You don’t have to worry about finding or renting space, setting up chairs or brewing coffee for anyone but yourself. You can also invite guest speakers to join your webinar and present their topic from anywhere in the world. You may miss out on some of the relationship-building that happens when you’re face-to-face with someone, however. Aside from real estate agents, there are also others in the industry that earn business from real estate transactions—mortgage companies, builders, movers and home security companies are just a few. Ask someone from one (or several) of these industries to team up with you to host your educational session. This can be beneficial for you in terms of splitting expenses, as well as supplying valuable knowledge about what a homebuyer or seller should expect when switching on their utilities or qualifying for a mortgage, etc. Before you approach a potential partner, think about what sorts of things they may be able to share. You don’t want your educational session to turn into a complete sales pitch. You and your partners should make usefulness the first priority; if you do that, the leads will follow. Promoting your session to the right people is imperative. A great way to do this is to leverage past clients to spread the word with shareable social media posts and emails. Your partners should also have a list of people they can invite to the session, and HOAs can help spread the word about seminars targeted toward homeowners. Add a page on your website with information about your session and a registration form. Free tools like Eventbrite can help you manage and collect registrations. Once you collect someone’s information, be sure to send them follow-up emails reminding them there’s a week, day and few hours until the session begins. Tip: Collect your attendees’ contact information. Without it, you have no way to follow up and convert your leads. In an ideal world, your FSBO session will convince attending homeowners to list their properties with you; however, you should build your session around helping them do it themselves. Be sure to give plenty of genuinely helpful advice and build your CTA around the idea that real estate is a tough business, so if they have any family or friends who don’t want to go it alone, please send them your way. People don’t always look for the same things in an investment property that they do for a home they’re planning to live in—value and easy upkeep are typically higher on their list of must-have features than granite countertops or a certain number of square feet. Focus on helping attendees figure out how to spot a good buy, what they should expect from the transaction and how to turn their investment into a profit. Tip: Be sure to make a slideshow presentation for your attendees to follow along with. Check out our article on creating a custom theme in Google Slides. After spending a couple of hours in their company, whether online or in-person, you should have had a chance to build rapport and a foundation of trust with your attendees. Now it’s time to start converting. Some people will be ready to work with you right away—have a copy of your calendar with you so you can schedule a meeting or listing appointment for those leads as soon as possible. Other attendees may still have steps to take before they’re ready to commit to a specific agent. Try taking polls throughout your session to determine what each attendee’s transaction timeline looks like. In a webinar format, have them type in their answers and keep a written record to refer back to. In a seminar, you may just have to remember or set aside a few minutes to go through it with each person and help them figure it out. Once you know when they’ll be transacting, you can set up an appropriate follow-up plan. This can be anything: phone calls, text messages, social media outreach, emails, direct mail, etc. Keep in touch with each of your attendees, even the ones who may be farther from a transaction than they (or you) may have hoped. Now you’re ready to start planning your first educational session to generate leads. Another great way to generate new business is by partnering with Homes.com. Homes.com has been one of the industry’s best sources of quality leads. Click here to see what our clients are saying about our quality leads.